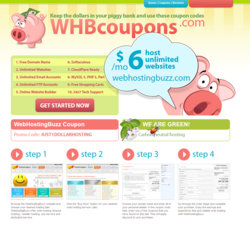 Learn more about the latest web hosting deals for WebHostingBuzz on the newly redesigned WHBCoupons.com website. WHBCoupons.com, the official WebHostingBuzz coupons site, has recently undergone a significant redesign, putting customers first with its improved interface for web hosting coupons. The site displays current WebHostingBuzz coupon codes and discounts, offering potential hosting customers the biggest savings on WebHostingBuzz hosting. WHBCoupons.com also features reviews and testimonials by customers, giving prospective buyers the chance to review what's being said about the company from current users of the service.